Annabelle Crouse is determined to reopen her great-grandmother's boarded-up house--and her shunned life. Many years earlier, after an unexplained absence, Julianne was relegated to a separate home by a rigidly unforgiving husband, and the Crouse women have suffered the disgrace of her assumed guilt ever since. Despite her family's strong disapproval, Annabelle is driven to pursue her mission through cobwebs and dust, finding the clues and the coded story left behind by her great-grandmother -- Why did she go? And why did she return? Annabelle has to know. Only one person, a man she grew up with but never noticed, stands with Annabelle as she discovers the parallels between her story and her great-grandmother's--two women, generations apart, experiencing what love truly is. 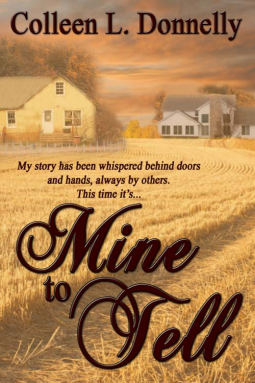 Mine to Tell is well written with a good plot and characters. I enjoyed the story and the author’s writing.